Black Coffee was robbed at gunpoint on eve of his wedding. On eve of his wedding reception at Sun City in Johannesburg South Africa, music mogul, DJ Black Coffee was robbed at gunpoint. 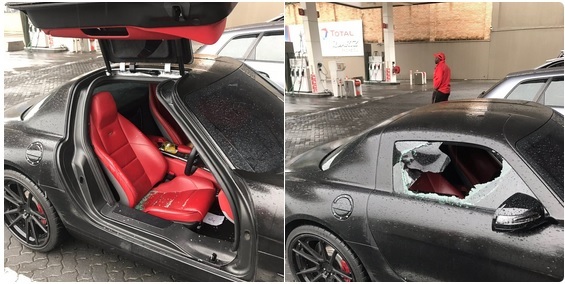 The world famous DJ tweeted that he was held at gunpoint by a man who demanded that he open his car window before he smashed it with a hammer. The gunman also demanded that Black Coffee hands over his watch. The suspect, according to Black Coffee was driving a white VW Polo Vivo. Black Coffee escaped the ordeal unharmed. A terrified Black Coffee tweeted: "White Polo Vivo. Video footage and number plate will be posted soon. Thank God I'm ok."
Yesterday Black Cofffee and his wife – actress Enhle Mbali Mlotshwa held a high profile white wedding. The wedding was reportedly planned by popular wedding planner, Sophie Ndaba while Mbali's designer, Gert-Johan Coetze is said to have tailored her wedding dress. On Thursday, the two signed their marriage certificate to seal the deal before the big wedding day. Ndaba and DJ Oscar "Oskido" Mdlongwa were among those who were there at Coffee's house to witness the couple sign. Oskido posted the video of the couple on his Instagram captioned: "Coffee pulled a surprise yomhlaba on me. A casual visit to his house, I witness a union of two beautiful spirits. "May your hearts be always near both in good and bad times. May you always hold on to each other with trust and faith. Wishing you a blissfully married life!"